Virtually every public speaking coach or organisation focuses on building their clients' body language, vocal tonality and script building skills. Some emphasis may be placed on story-telling techniques, the use of humour, working with Microsoft PowerPoint and all the usual stuff we come to expect from presentation skills coaching. Confidence is typically built through repetitive practice until enough tools are rehearsed to get the client through their presentations more effectively. There is an underlying force that drives truly empowered and memorable interpersonal communication. Call it the "Public Speaking Secret". I'm talking about the kind of secret that can accelerate you way above average, or adequate, into what you might call remarkable territory. If you understand this concept, and build a solid presentation skill-building system around it, you can develop your entire suite of skills lightening fast, with stunning results. The CORE is the culmination of that system, together with the best frameworks and techniques discovered and developed by the finest World Champions of public speaking. The CORE took nine years to develop. It was a long but magical road. I've competed with, coached and studied with the best. My biggest influences include Craig Valentine (1999 Public Speaking World Champion and founder of the World Class Speakers Network, of which I am a proud member) and Darren LaCroix (2001 World Champion, and a hell of a funny guy). 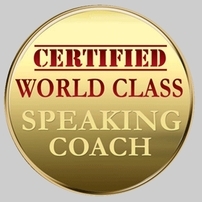 I've been mentored by truly inspirational speaking coaches. Public speaking is not about perfection... it's about connection! The single most important driver of interpersonal communication is emotional connection. The most charismatic, persuasive and memorable speakers all manage to make strong and lasting emotional connections with their audiences. As a quick exercise: Make a list of your favourite public speakers (politicians, comedians, television presenters, radio disk jockeys, actors, athletes, coaches, teachers, friends, family members, whoever). Names like Oprah Winfrey, Barack Obama, Bill Clinton, Mary McAleese, Mary Robinson frequent the many lists I've seen. Now list the traits you would use to describe them. Traits such as "charisma", "confidence", "passionate", "inspirational" and "enthusiastic" seem to dominate this list. All of these traits, by the way, are emotional. That is to say, they are directly related to emotional states. Our first, last and most memorable impressions of any speech (and speaker) are emotional. To be emotionally connected to yourself, by the way, means to be emotionally empowered. CORE itself stands for COnnect and Respond with Emotional empowerment. It is important to note that when you are emotionally empowered your body language and vocal tonality are greatly enhanced. Of course there are key techniques and conventions around body language and vocal tonality that must be understood, and we cover the all of them, but we prefer it if speakers are sincere and spontaneous as much as polished and practiced. For example, someone who speaks passionately about a topic they love tends to employ smoother more spontaneous hand gesturing than someone who is thinking about getting through a presentation in one piece. You might worry about what to do with your hands as a presenter in front of your audience, but I bet you never think of your hand gesturing when you are in the pub ranting to your friends about who won X-Factor the night before. The difference? A solid emotional connection to your topic, audience and most of all... yourself. WHAT DOES THE CORE COVER? Let me ask you questions about speeches you may have seen in your career so far. Have you ever sat through a presentation and experienced any of the following? The CORE explains where these issues come from, and steers you clear of them forever. IS THE CORE DIFFICULT TO LEARN? The CORE is a quick, easy and enjoyable process. Once you get the hang of World Class Structuring it will boost your confidence knowing why and how it can work for you... and your audiences will love it. Additionally, we show you how to understand what is happening within you on an emotional level, where it comes from, and how it can affect your audience. By the way, no manipulation is involved on any level. Our system is the exact opposite. We focus on authenticity, sincerity, passion and mutual satisfaction. And our system helps you to deal with heated or potentially hostile scenarios in a way that everyone benefits from the experience. My background in specialties such as NLP, EFT and the Sedona Method have helped me to shape the fear-busting aspects of the CORE. We have powerful techniques to rid you of your deepest psychological blocks. However, you may find your fears and limiting beliefs fall away without needing specific attention as you work through our speech building and delivery process. You will also find that presenting in front of an audience becomes an increasingly enjoyable process. We will show you how to lock in that positive feeling, conditioning yourself for success every time. By the way, if you don't have any serious fears or limiting beliefs around public speaking the CORE will catapult your skills just as effectively. Emotional empowerment, with its positive effects on the writing and delivery process, benefits everyone. The CORE forms the basis of all our courses and coaching services, and we operate a warm, encouraging environment where you can challenge yourself in a self-assured way. Our system requires no prior public speaking experience. WHO IS THE CORE DESIGNED FOR? The CORE is designed specifically for any presenter who is required to make a career-related presentation. In other words, the CORE is made for anyone who needs to present in their job, business or college course. In professional life, people are required to speak all the time; inspirational speeches to teams and colleagues, sales pitches to potential customers, job interviews, technical presentations, workshops... you name it, it's out there. Do you need to inspire an audience somewhere? Not a problem. Do you want to sell products, services or ideas? Get ready for new customers. Do you have a requirement to make technical concepts exciting and easy to understand? We have you covered. With the CORE system, you can cast off fears and limiting beliefs within minutes, while you develop a unique, authentic and engaging presentation style that's permanent. For your audience the results will be memorable... and for all the right reasons.